Whether you’re longing for an evening drink, fresh air or a great view, Terra Rooftop Bar will satisfy. I arrive just as the golden hour envelopes the breezy and expansive space that is Terra. Set in Suntec City’s Sky Garden enclave, this newly-minted rooftop terrace bar is evocative of a glasshouse or spacious veranda. 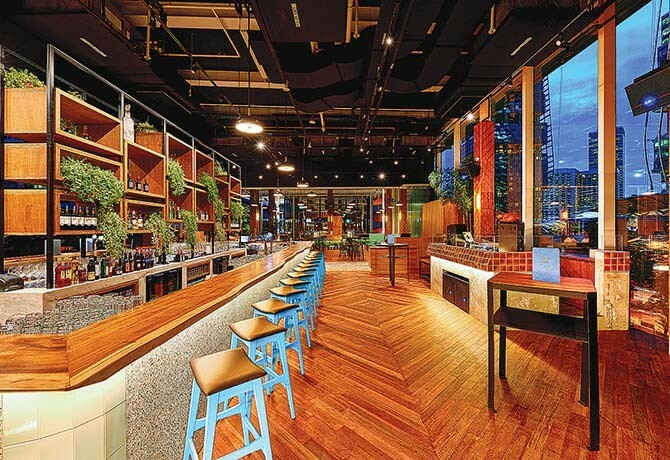 Helmed by the same folks behind Kyo and Refuge, Terra looks set to be a promising contender in the rooftop bar scene. The setting comprises tall ceilings and textured wood panels along with green foliage hanging off a 27m-long terrazzo-panelled bar. Between the indoor and outdoor seats, I chose the latter as I could cosy up by the bar with a glass of White Sangria ($18). 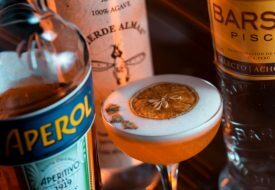 It was a refreshing and fruity concoction enlivened with the sweetness of peaches. 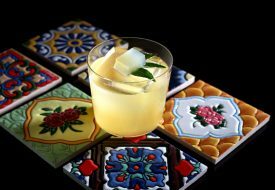 Taking after the bar’s aesthetics, the drinks mainly feature botanical elements with garnishes such as thyme, mint and basil, and rosemary and coriander. 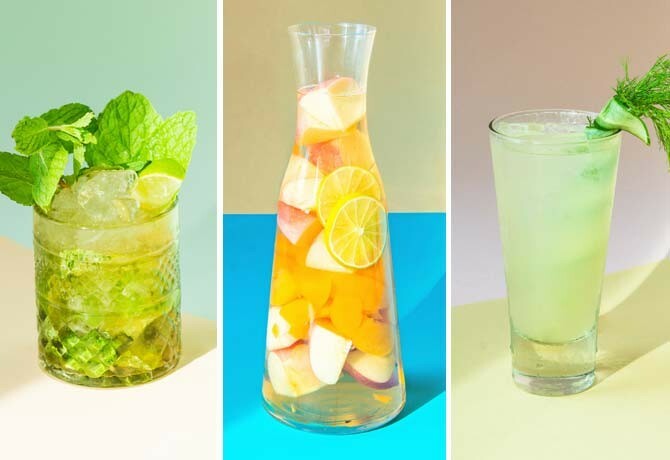 You’ll find the cocktails such as their take on the classic Mojito ($18) and the novel gin-based, aloe vera-infused Aloevation ($18) refreshing. If you’re up for it, take your taste buds on a ride with shooters like the Spicy Mexican ($30 for a pair), featuring the fiery Hot Donkey Cinnamon Tequila. Sautéed prawns are coated in a spicy chocolate sauce for a snack that tastes savoury with just a pleasant hint of cocoa. 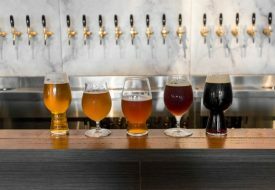 Terra probably understands that drinking on an empty stomach isn’t a good idea, that’s why its bar bites are equally delightful. The dishes, which feature a strong Latin American influence, are separated into Nibbles and Bites. What’s the difference, you ask? The latter comes in bigger portions, for sharing. Of the Nibbles, the Gambas Con Chocolate ($14) was the most interesting. 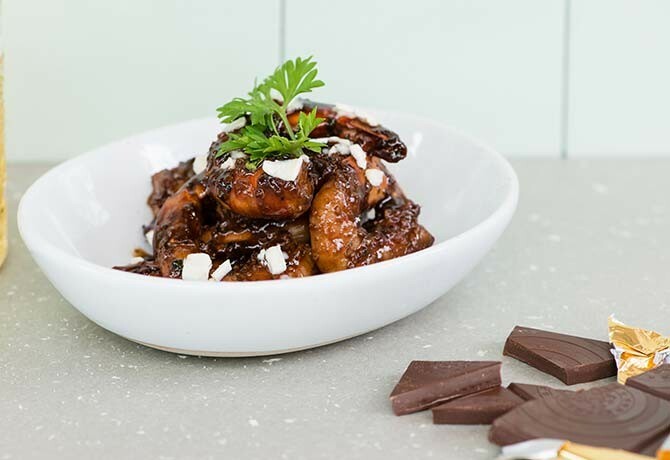 Sautéed prawns are coated in a spicy chocolate sauce for a snack that is savoury with just a pleasant hint of cocoa. Equally delightful are the Stuffed Piquillo Peppers ($9). I couldn’t stop popping the sweet piquillo peppers, which are stuffed with minced meat. Crunchy and well-seasoned, they’re best accompanied by one of the cocktails. Whether you’re longing for an evening drink, some fresh air or simply a great view, Terra Rooftop Bar will satisfy you. Enjoy happy hour from 3pm to 8pm on weekdays at Terra Rooftop Bar, Suntec City Sky Garden, 3 Temasek Boulevard, #03-308, Singapore 038983, Tel: 6336 6009. A version of this article appeared in the print edition of Weekender, Issue 149, April 1 – April 14, 2016, with the headline ‘Rooftop Terra-tory’.